A sharpening steel is good for two things: One, it smooths out the rough edge on a blade after you sharpen a knife on a whetstone. And two, it helps revive that edge after you've been cutting, slicing or chopping for a while. You've probably seen people on TV whipping their knife back and forth on a knife steel at high-speed. And as you might have suspected, yes, they're just showing off. There's no reason to do it that fast, and you might cut yourself if you try. In fact, the safest way to use a knife steel does not involve having the knife edge facing you at all. With your left hand (or your right hand if you're left-handed), hold the sharpening steel point-down, with its tip resting firmly on a dry cutting board — as if it were a large nail you were about to hammer into the board. With your other hand, hold the knife crossways against the steel with the back of the blade (the part nearest the handle) touching the steel. You're going to be pulling the knife backward, toward you, so you want to start with most of the blade in front of the steel. Now, maintaining this 22½-degree angle, gently pull the blade toward you while simultaneously gliding it downward along the shaft of the steel. You want to cover the entire length of the blade, keeping the blade at that 22½-degree angle the whole time. Imagine you're trying to slice off a very thin piece of the knife steel. Do this step 10 times. Switch to the other side of the blade, give it ten more strokes on the steel and you're done! Make sure your sharpening steel is at least as long as the blade you are honing. 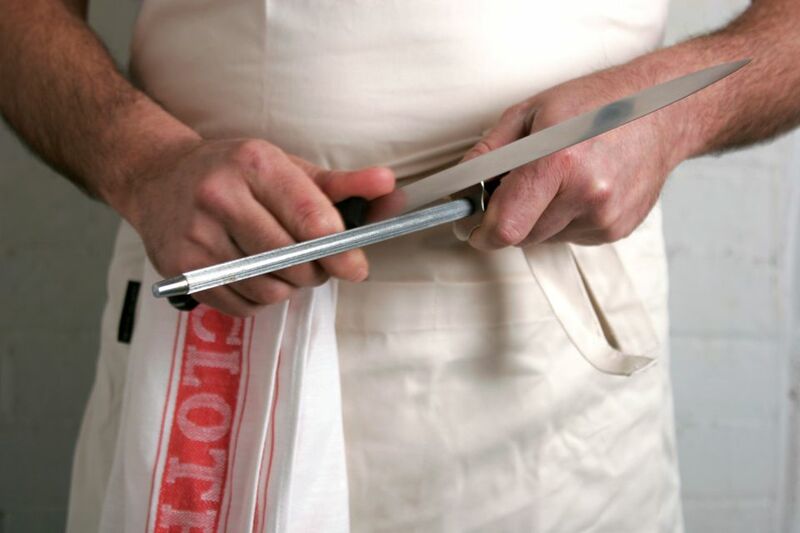 For instance, if you are using a 10-inch chef's knife, your knife steel should be no shorter than 10 inches as well. After using the sharpening steel, rinse and carefully wipe the blade dry with a towel so that any tiny metal filings on the knife's edge don't end up in the food you're about to work with. Keep your knife steel handy while you're working in the kitchen. Just a few minutes of ordinary slicing on a wooden or plastic cutting board can knock your knife's delicate edge out of alignment. Once you're accustomed to the feel of a sharp knife, you'll feel the difference right away. When you do, just a few quick strokes on the steel will straighten it right out again, without having to grind away any more blade on a whetstone.